Huge declines in electronics were offset by gains in non-electronic products. Singapore's non-oil domestic exports (NODX) rose 1.1% YoY in the first quarter of 2018, easing from the 10.4% jump last quarter, due to declines in electronics (-7.9%) offset by increased shipments of non-electronic products (+4.5%). According to Enterprise Singapore, the declines in electronics were caused by exports of integrated circuits (IC), parts of personal computers (PC), and diodes & transistor, which fell 9.8%, 43.9%, and 16.8% respectively. Meanwhile, higher domestic exports of food preparations (+136.7%), non-electric engines & motors (+184.5%), and specialised machinery (+10.9%) contributed to non-electronic product export growth. NODX to all top markets rose over the year, except for China, Taiwan, Hong Kong, and Thailand. The biggest contributors to the NODX increase were the US (+45.6%), Japan (+20.6%), and Indonesia (+11.1%). 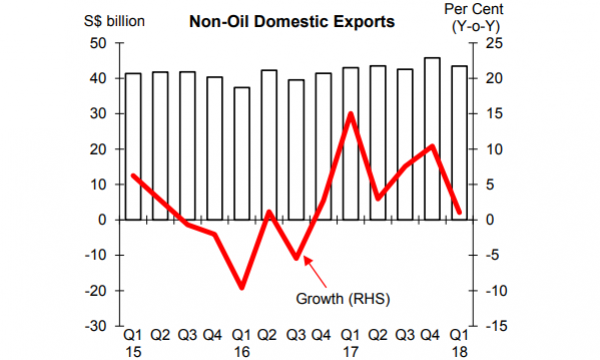 Non-oil re-exports (NORX) jumped 1.5% in Q1, following the 1.4% decline last quarter, thanks to the higher shipment of non-electronic re-exports (+4.5%) which outweighed the decline in electronics (-1.5%). NORX to the top markets as a whole rose in Q1, albeit shipments to China, South Korea, Taiwan, Hong Kong, and Thailand decreased. The biggest contributors to the increase were Indonesia (+11.6%), the US (+10.0%), and Japan (+11.7%). Oil domestic exports jumped 8.6%, extending the 26.1% growth last quarter. However, volumes dipped 1.5% after an 8.4% growth in the previous quarter. Oil re-exports also contracted by 19.7% alongside volumes decline of 27.2%. Singapore's total merchandise trade jumped 2.5%, softer than the 7.8% increase in the previous quarter, as both oil and non-oil trade rose. Oil trade grew by 5.1% after the 27.7% growth last quarter amidst higher oil prices. 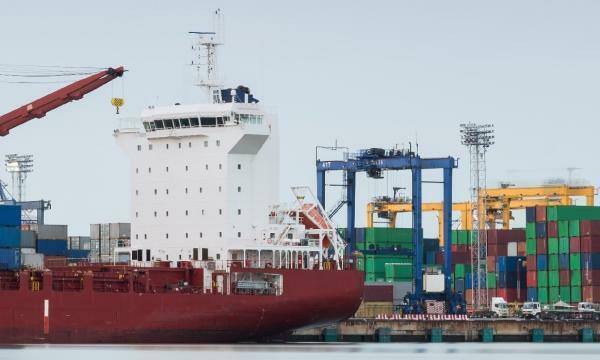 Non-oil trade rose by 1.9%, following the previous quarter’s 3.6% increase. "The growth outlook for some of Singapore’s key trade partners such as China, Japan and ASEAN-5 is expected to moderate from 2017’s pace or remain unchanged in 2018," ESG commented. "Overall, the growth for both NODX and total trade is expected to remain firm in 2018 but ease from 2017’s strong performance. Taking the above into consideration, the 2018 growth projections for NODX and total trade are maintained at 1%-3% and 3%-5% respectively."